TODAY is Victory in Iraq Day. By every measure, The United States and coalition forces haveconclusively defeated all enemies in Iraq, pacified the country, deposed the previous regime, successfully helped to establish a new functioning democratic government, and suppressed any lingering insurgencies. The war has come to an end. And we won. What more indication do you need? An announcement from the outgoing Bush administration? It's not gonna happen. An announcement from the incoming Obama administration? That's really not gonna happen. A declaration of victory by the media? Please. Don't make me laugh. A concession of surrender by what few remaining insurgents remain in hiding? Forget about it. And since there will never be a ticker-tape parade down Fifth Avenue in New York for our troops, it's up to us, the people, to arrange a virtual ticker-tape parade. An online victory celebration. 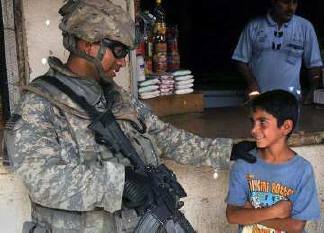 Saturday, November 22, 2008 is the day of that celebration: Victory in Iraq Day.